Ear, Nose, Throat & Sinus Specialists - Dr. Edgar Lueg, Ventura, CA - Nasal Congestion, Deviated Septum, Septoplasty, Turbinoplasty, Polyps & Polypectomy – What does it all mean? Nasal Congestion, Deviated Septum, Septoplasty, Turbinoplasty, Polyps & Polypectomy – What does it all mean? This is perhaps the most common nasal symptom that I hear from patients. Unfortunately it can mean very different things to different people. So it is my job as a Sinus and Nasal Specialist to try and figure out exactly what each particular patient means. For most people being “congested” means that “they cannot breathe through their nose well”. This is often from a viral Acute Upper Respiratory Tract Infection or the “Common Cold”. It can also be from Nasal Allergies, Smoking, Air Pollution and Irritants. 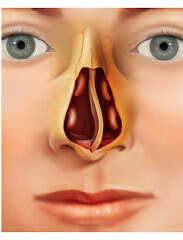 It can also be from actual physical or anatomic blockage of the nose (which we will now discuss below). 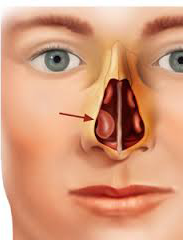 The Nasal Septum is the thin bony wall that runs back from the tip of your nose to your throat and divides your nasal cavity or airway inside into a right and a left side. It really can be considered the “party wall of your nose”. In adults it runs for 2-3 inches backward from your nostrils to your throat. For some unknown reason many people are born with this wall being quite crooked, bent, curved, or what we call “deviated”. For some people the septum becomes deviated following trauma to their nose. A deviated septum is one of the most common causes for feeling nasal congestion or blockage. Septoplasty is the medical word for the surgical procedure “re-shaping your Nasal Septum”. This is done by operating through your nostrils with special instruments. Most Ear Nose & Throat (ENT) Surgeons will lift up the skin covering the septum which is made up of cartilage in the front and bone in the back and re-shape or remove deviated or “spurred” (small spurs of bones that come of the Septum) parts of the septum and then replace the skin over it. In most cases a splint will be left in at least one day in order to keep everything straight inside after surgery. Turbinoplasty is the medical word for the surgical procedure “re-shaping your Nasal Turbinates”. Your Turbinates are the curved humidifiers of the nose that hang down from the sides and help warm and moisturized the air you breathe in before it gets into your lungs. Often, especially as we get older, our Turbinates get bigger and sometimes overgrow or “hypertrophy” which is a very common cause of Nasal Congestion and Blockage as well. The Turbinates can be reduced in size by operating through your nostrils with special instruments. Most Ear Nose & Throat (ENT) Surgeons will lift up the skin covering the Turbinates to remove some part usually about a third at most of the Turbinates although some surgeons use electrical cautery or other means of reducing the size of the Turbinates. Overly enlarged Turbinates is one of the most common causes of Nasal Obstruction. Polyps are soft tan colored grape-like tissue swellings that some people get after having chronic inflammation in the nose usually from Nasal Allergies but also from smoking or environmental irritants. They can block the sinuses causing Chronic Sinus Inflammation (aka Chronic Sinusitis), sense of smell and even your breathing when they get big enough. Polypectomy just means “removal of Polyps” and is usually done with a specialized surgical instrument with a round rotating blade called a Microdebrider while you are under General Anesthesia and takes just few minutes generally.